The question and answers in the link above talked about removing the input methods to stop switching of the methods. I differ because I want to KEEP the input methods. But remove/disable/prevent the [Windows]+[Space] hotkey for toggling them. I have two Inputs Methods. (Two keyboard layouts in fact), The Standard UK layout, and created a second keyboard layout, I have called it ABC Layout, but its actually just a bunch extra symbols like copyright and a large number of other such symbols. There is a Hotkey in windows 8.. Its [Windows]+[Space].. I would like to disable this. This hotkey toggles between the two Inputs.. Sounds convenient, but it really is not. I don't know how or when, but it seems I sometimes hit this Hotkey without wanting to and end up with all sorts of gack on the screen if I am reading something off a second screen/paper. I have gone into the logical location in the settings that deal with input and language control and the Hotkeys that deal with them. As you can see in the picture I had supplied, I have already removed the Hotkey for toggling [Please see image below], but Pressing [Windows]+[Space] still toggles the Input Mode. 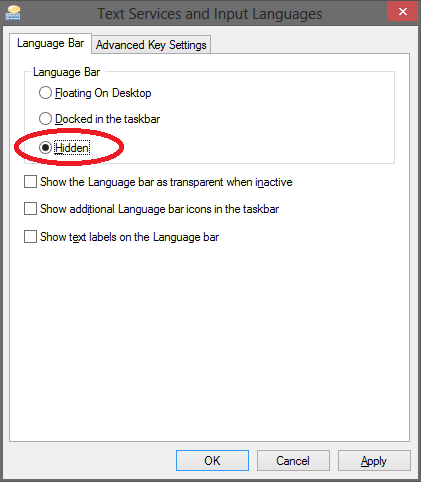 It seems in Win8, they have these options, but then just ignore them and do whatever it wants anyway as I have ALSO set language bar to be Hidden. But as you can clearly see in the screenshot, it's still there. That remaps the Win(#)+Space(Space) button to do nothing. Then you just run the AutoHotkey Script. To get it to run automatically when your computer starts, put the script into the startup folder. Hopefully autohotkey isn't too intrusive. Maybe you'll find some other uses for it (I think I first found out about it when I was trying to remap Caps-Lock so that it doesn't do anything, since that's the world's most pointless key). 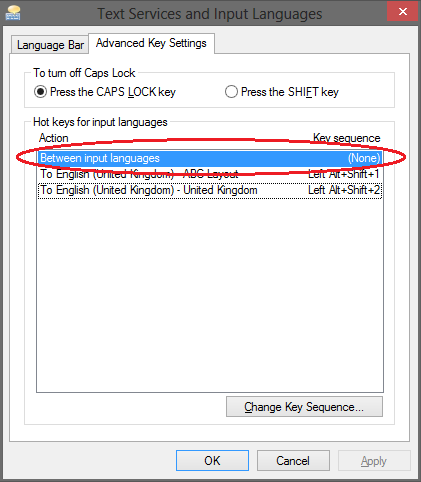 And you also can disable the windows key completely with Widnows Scancode Map feature. 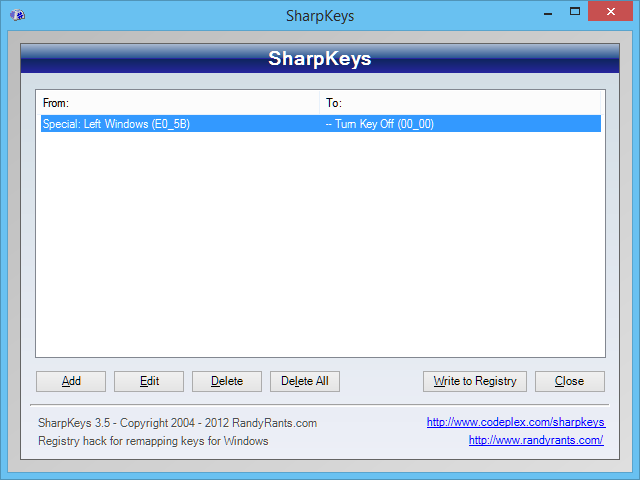 To do it, i recommend to download an open source application called SharpKeys. You can add new keymap, type the key (press win button), and select Turn Key Off option (see the picture bellow). Press write to registry button, and restart windows. Not the answer you're looking for? Browse other questions tagged windows windows-8 keyboard-shortcuts hotkeys or ask your own question.